Zvi Hecker was born in 1931 in Krakow, the medieval capital of Poland and spent his teenage years in Samarkand, the city of Tamerlane. At the age of thirteen, Samarkand became the subject of his first architectural drawings. This brought him close to his future profession and his love of Oriental Architecture. Back in Krakow after the Second World War, he enrolled into the School of Architecture at the Krakow Polytechnic, but immigrated soon after to Israel where in 1954 he enrolled at Technion, the Israel Institute of Technology in Haifa, where he received his degree in engineering and architecture. He continued to study painting at the Avni Academy of Art in Tel Aviv until 1957. Following military service in the Corps of Engineers of IDF, he set up a private practice in 1959 in Tel-Aviv with Eldar Sharon (until 1964) and Alfred Neumann (until 1968). Together they have designed the Club Mediteranné in Arziv, the City Hall of Bat-Yam and Dubiner Apartment House in Ramat Gan. In the seventies Zvi Hecker worked on the design for Montreal City Centre, built the Military Academy in the Negev Desert, and the Ramot Housing in Jerusalem. In the eighties, he took part in the Tokyo Forum competition, designed the Ramat Hasharon City Centre and realised the Spiral Apartment House in Ramat Gan. In 1991 Zvi Hecker moved to Berlin to work-out the winning design for the Jewish School in Berlin, followed by the Jewish Cultural Centre in Duisburg and the Memorial Site for the Lindenstrasse Synagogue in Berlin (with Micha Ullman and Eyal Weizman). In 1995 he designed the Frederick Kiesler exhibition at the Centre Pompidou in Paris. At the same time in Tel-Aviv, together with Rafi Segal, he built the Palmach Museum of History. His more recent projects include the design of the Jewish Museum in Warsaw, the Market Hall in Bethune, France, the "Amber Baltic" Apartments in Miedzyzdroje and the Koningin Máximakazerne at the Schiphol Amsterdam Airport, currently under construction. 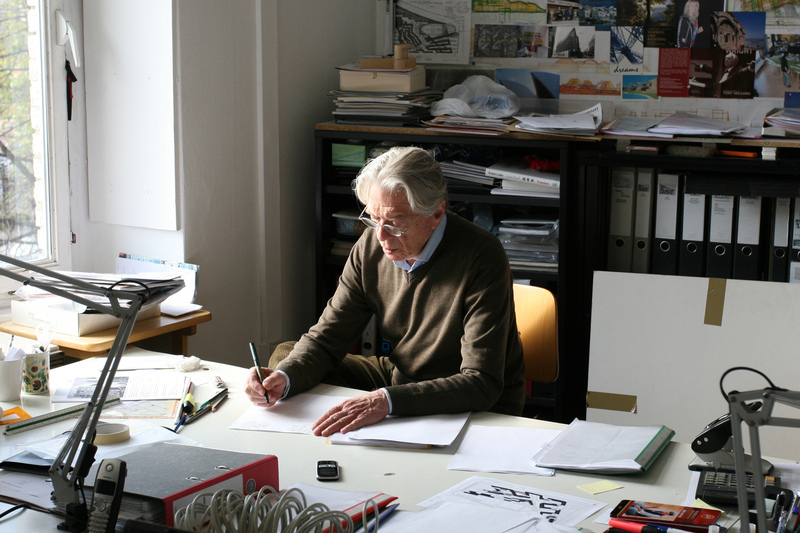 Zvi Hecker was a visiting professor at Universities in the US and Canada, guest professor at the Universität für Angewandte Kunst in Vienna and continues to lecture frequently at numerous schools of Architecture. In 1991 he represented, with others, Israel at the 5th Venice Biennale of Architecture, and took part in the 6th, 7th, 9th and 10th Biennale of Architecture in Venice in 1996, 2000 and 2004, 2006 respectively. Zvi Hecker has won a number of architectural competitions, and was awarded the German Critic Prize for architecture in 1996 in Germany and in 1999 the Rechter prize for architecture in Tel-Aviv, Israel. Since 2013 he has been an Honorary Fellow of the American Institute of Architects (AIA) in 2016 recipient of the "Merentibus" Medal from the Scientific Council of Krakow Polytechnic.